Actually, lot of things changed in WordPress since the time we are using initial versions of WordPress. 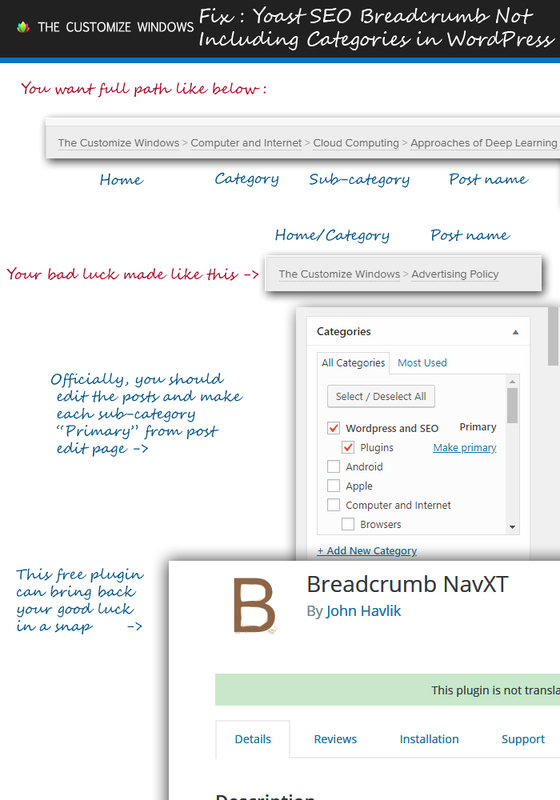 Here is How to Fix Yoast SEO Breadcrumb Not Including Categories in Genesis For Sub-Categories Post. You Have Conflict With Old WordPress Style Categorization of Posts, Like Most of the Old Users Have. Your current condition is just bad for SEO. Genesis is practically kind of “paid WordPress default theme” due to involvement of lot of peoples from WordPress core to StudioPress Genesis, you can easily use this way for any hand coded theme. A decade back, we used to create category like Computer and Internet, add subcategory like Cloud Computing. While we used to write post, we clicked both Computer and Internet and Cloud Computing as category of a particular post. There were many practical reasons behind it. With time, if you include a post in Cloud Computing subcategory; actually WordPress itself counts it to be included in Computer and Internet category. That feature accompanied with an option “Make Primary” clickable link appears inside categories box in post edit screen on hover if multiple categories is assigned to a post. In other words – you do not need to make WordPress understand that Computer and Internet category is a catchall category. This was not quite obvious conflict in most plugins, themes till recent time. Partially, and only if more than 1 categories are attached to the post/product. If only one is selected, “Primary Category” text is hidden. If you select two categories then the “Make Primary” is selectable next to every attached category. You actually need to Edit the post and hover over Category name in WordPress post editing page to see “Make Primary” option. If you click “Make Primary”, that post will show the full path. That will do the job. It is actually robust way. This method is like Method 2 but instead of making Primary, you can remove the category and keep only the subcategory. This is not recommended for blog sites as it can harm SEO. Additionally the old logic to include in both category and sub-category was not incorrect logic. This is painful if you have thousands of posts like us. If you have only few hundred of posts, you can bulk edit. This built-in feature of WordPress can come in very handy. Go to “All Posts”, click and select on the current subcategory you are thinking to make appear the whole path, like Cloud Computing subcategory in our example and click “Filter”. It will list all posts assigned to Cloud Computing subcategory. Tick the box called Title. Tick the box called Title to select all on the page. Click on the drop down option named “Bulk Edit” and click “Apply”. Tick the subcategory like Cloud Computing subcategory in our case to these posts. Click on Update. It is database intensive job. You should not have hundreds of posts in one page of “All posts”. It is probably safe to take a backup before doing it. This Article Has Been Shared 1906 Times! Here are five popular SEO plugins for Wordpress which can help your blog running better. Remove WordPress plugin from database which is/are previously used but no longer required might not be as simple as going to Plugins page and deleting it. Choosing WordPress and HTML Template for a Website is not really that easy that it might sound. This quite difficult as both has limitations of their own. Cite this article as: Abhishek Ghosh, "Fix : Yoast SEO Breadcrumb Not Including Categories in Genesis For Sub-Categories Post," in The Customize Windows, April 25, 2018, April 23, 2019, https://thecustomizewindows.com/2018/04/fix-yoast-seo-breadcrumb-not-including-categories-in-genesis-for-sub-categories-post/.